It all started with a Buy-One-Get-One-Free special at the market. I don’t normally take advantage of these deals because for two of us its often too much of something and it goes to waste. But for some unknown reason I bought the grape tomatoes being offered, and got the other one free. OK, now what to do with them? Other than put these sweet little tomatoes in salad, I really don’t cook with them, although I’m starting to. Coexisting in my refrigerator there was also half a bag of arugula that I wanted to use up, and four slices of thick bacon. Put all those items together and they spell BLT. What could taste like a BLT sandwich but be substantial enough for a Friday evening supper? How about a pizza! I always have a bag or two of frozen pizza dough on hand, so I took one out of the freezer to defrost, and in about 2 hours I was ready to get creative with my pizza. First I cooked the bacon till crisp, drained it and broke it into pieces. Then in the drippings remaining in the pan I briefly cooked the tomatoes with a little salt and the red pepper. I always use a pizza stone to bake pizza, so I sprinkled a little cornmeal on that and patted and stretched the dough into a 12 inch circle to cover it. Cornmeal helps to get a crispy crust and keeps the dough from sticking. 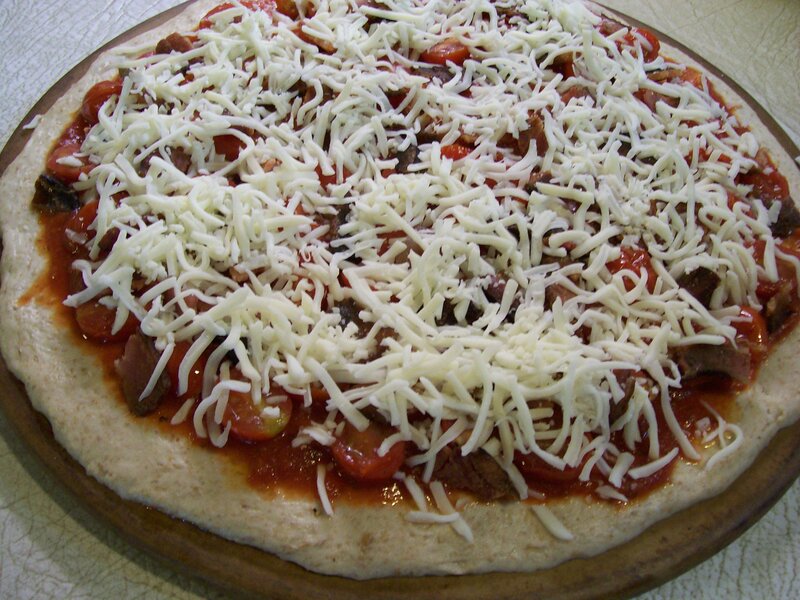 Next I spread a little pizza sauce on the dough, topped that with the tomatoes, then the bacon pieces and of course lots of cheese. 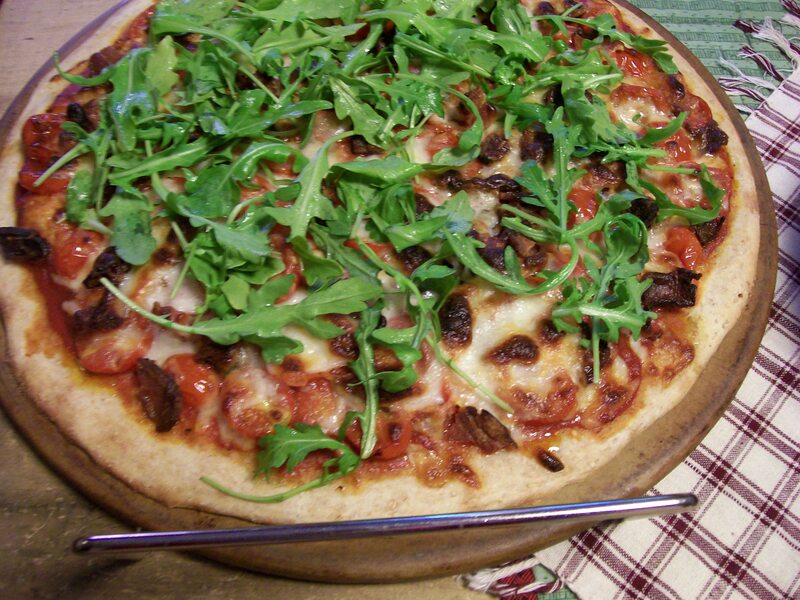 Once baked and out of the oven I scattered a layer of arugula over the top. The smell of this pie baking brought Mr. D. to the kitchen without being called, so I knew I was on to something good. Mouthwateringly delicious is what it was. I know I’ll be making this one again–and again! Preheat oven to 450 degrees. Sprinkle a baking sheet or pizza stone with cornmeal; roll or stretch dough into a 12-inch circle, and place on prepared pan. Cook bacon in a skillet over medium heat until crisp. Remove to paper towel. Break into pieces or crumble. Add tomatoes, red pepper and a little salt to drippings in pan; cook 2 minutes, stirring occasionally. 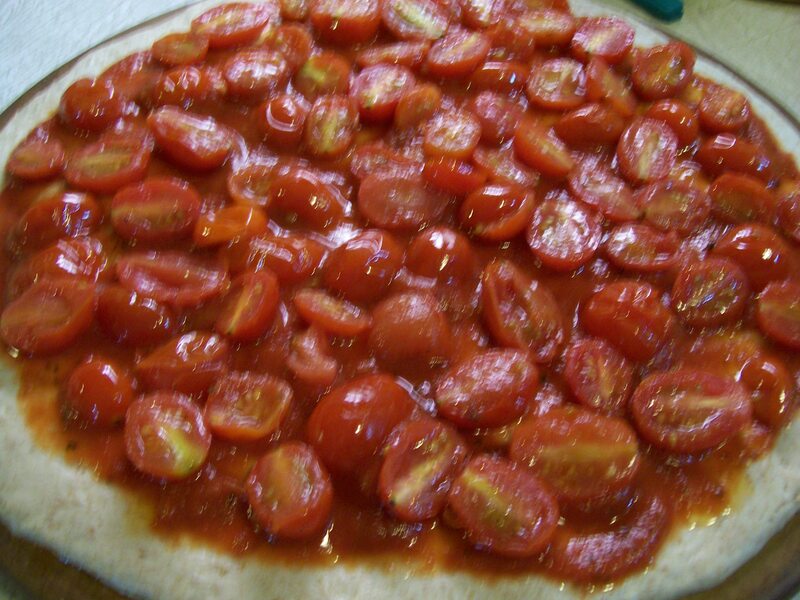 Spread sauce evenly over dough, leaving a small border. 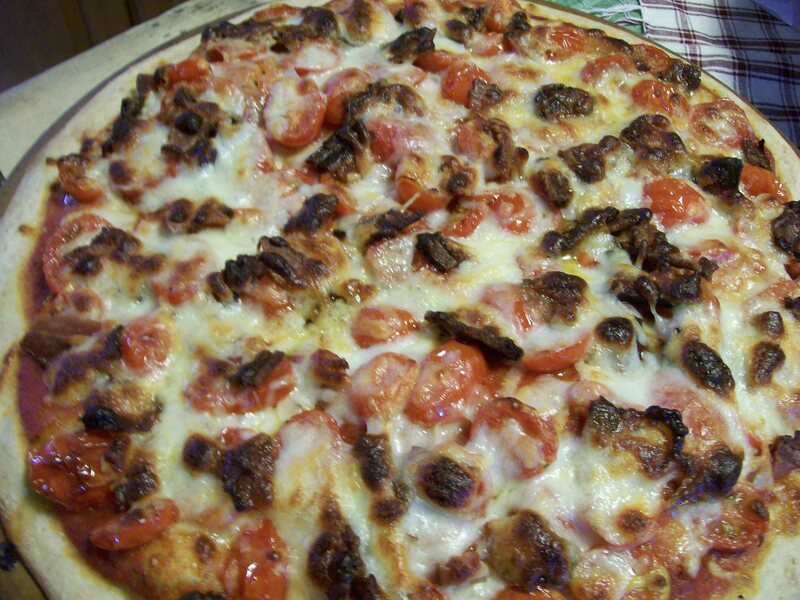 Top with the tomatoes and bacon. Sprinkle cheese over top. Bake at 450 degrees for 17 minutes or until crust is golden. Remove from the oven and sprinkle arugula over the top. Cut into 8 wedges and serve immediately.